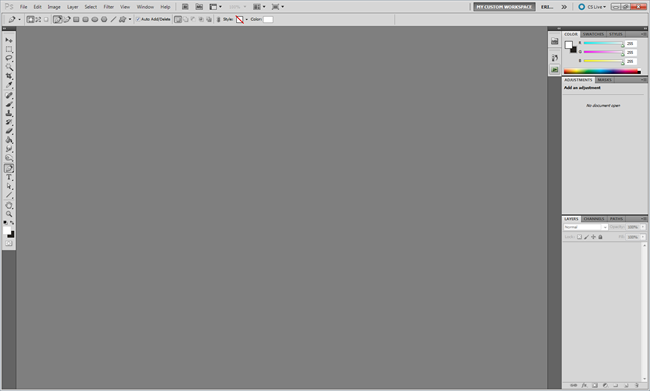 One of the often overlooked features of Photoshop is the easily customizable GUI. If you’ve just been using the standard workspace, this simple how to will give you all you need to make your Photoshop workspace truly your own. 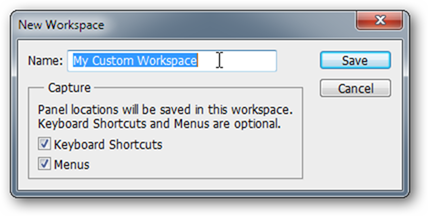 Our task today is to create our own custom “workspace,” or a saved file with locations of panels, menus, and shortcuts. This allows pros to create multiple workflows depending on what kind of files they’re working on. Are they doing color corrections? Are they editing images for the web? Are they doing digital paintings? You might use entirely different panels depending on what you’re doing, so having multiple workspaces can save you a lot of time. 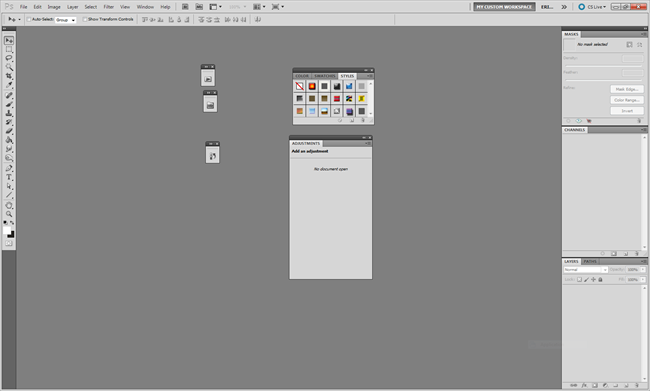 Today, we’ll touch on how to customize a workspace for a more basic need—to make it easier for you to use Photoshop, and keep the panels close by that you use the most. 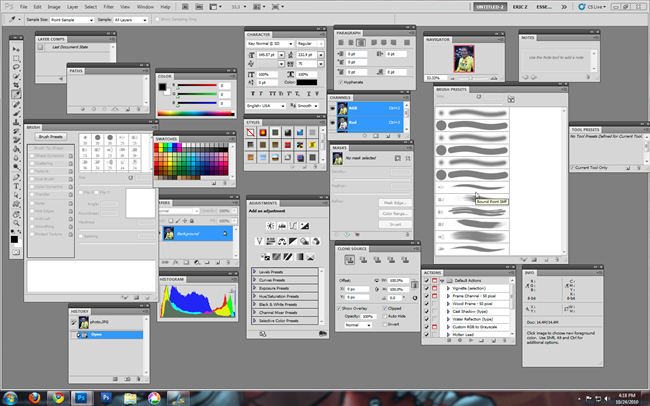 Out of the box, Photoshop for Windows should look something like this. Creating a customized workspace is easy. 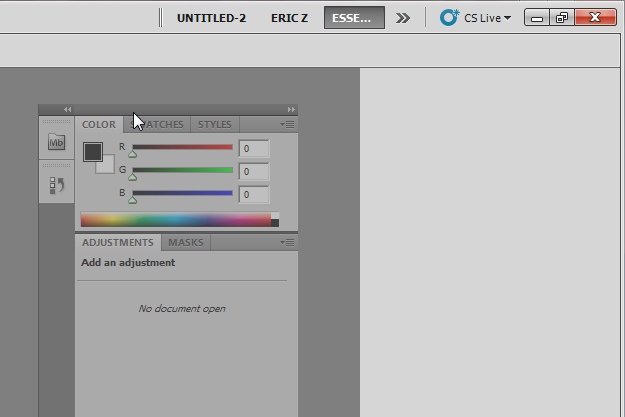 Go to the top of the screen where you see “Essentials” (in CS5) and find the button. 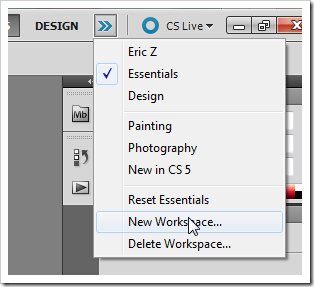 This drop down menu will allow you to create a new workspace, as shown. Your new workspace starts off with default panels. It’s pretty ho-hum. Take note that by default, these panels are snapped to the sides of the screen. Clicking and dragging on any of the elements will break them free of the snap, and allow you to move them wherever you want. 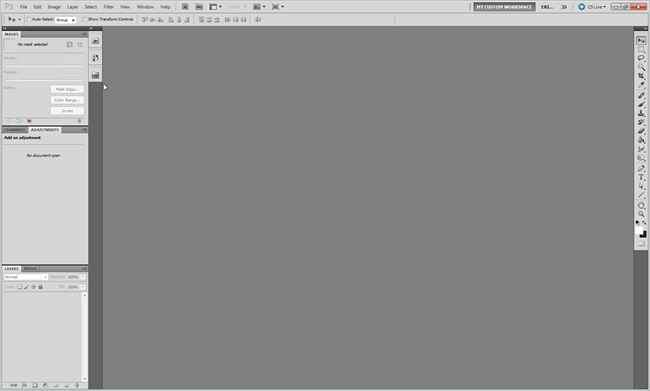 Don’t worry about saving your workspace as you edit, because Photoshop will track every panel as you move it. Simply click and drag any panel either from the top bar or by the name tab (see above where it says color, swatches, styles, adjustments, masks, etc.) on the top of the panel. 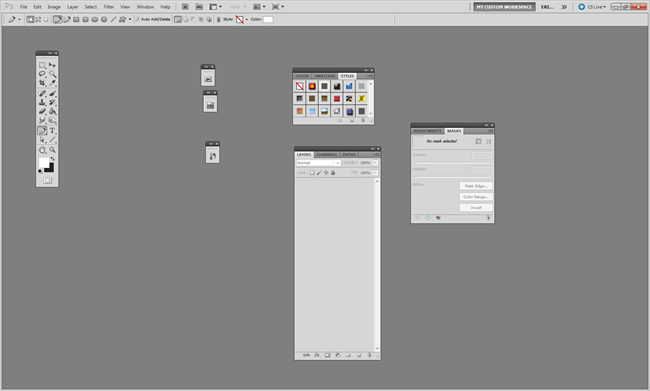 Depending on how you like to use the program, you can work with “free floating” panels or utilize the snap. Drag panels to the left and right sides of the screen. When you see this blue line, you can snap them back to the side, or install new ones. The snapped panels seems to be the way that Adobe is pushing users into. Depending on your preferences, set up your panels to effectively use your screen’s real estate and compliment what you do in Photoshop. 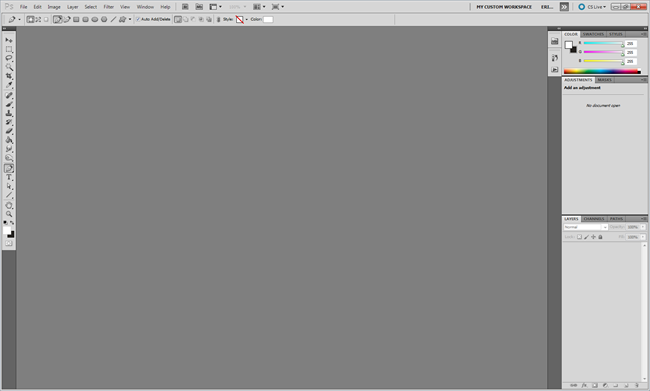 For instance, when you see a layout like this one, fix it—that huge column of layers is eating up way too much space. Drag a panel above a panel already snapped. If you see a blue box, you’ll add new tabs to an existing panel. If you see the blue line, you’ll add the whole panel in a new segment above the other panels in that column. If you work extensively with layers, channels and masks, these right side panels could be a good setup for you. Notice how the “Paths” panel has a tab behind “Layers.” Any panel can be added as a tab behind any other panel, if you wish. It’s also very simple to add additional columns. Simply drag panels to the side and install them as shown. You can add columns of panels until they eat up nearly all of your screen. And there’s no rule about keeping your toolbox on the left side either. No reason not to switch it up if you’re left-handed. If you’re not sure what panels will work best for your workflow, check out the How-To Geek Guide to Learning Photoshop, Part 2, where we talk a little bit about workspaces and also explain the entire set of panels. Navigating to Edit > Keyboard Shortcuts is the simplest Photoshop tip ever passed on at How To Geek. Let’s take a look at how we do that. This is the dialog box for editing shortcuts. It’s pretty straightforward, despite all the zillions of options. 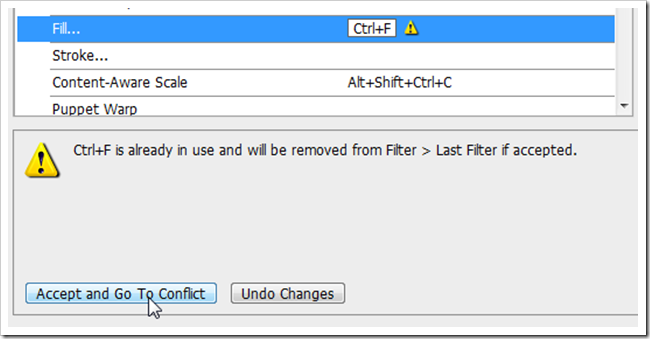 You can choose to save your edits into any workspace. Here, you’ll notice that it is saving into the new Custom Workspace we created and chose not to name Richard M Nixon earlier. You can overwrite the defaults here, if you choose to have defaults that don’t match the keyboard shortcuts in any Photoshop howto. 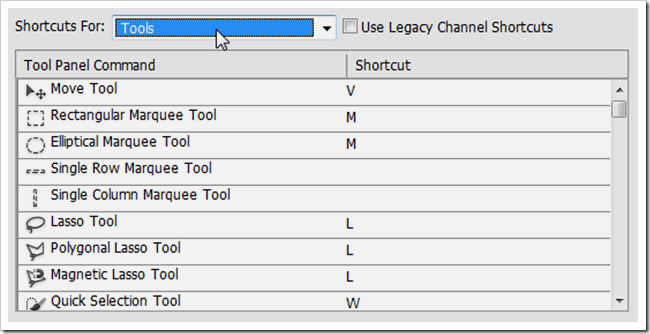 Use the pulldown tab to edit the shortcuts under any of the menus for File, Edit, Layer, etc. You can change any of them to practically any key combination that suits you or that you can remember. Adjust shortcuts to where they make sense to you. 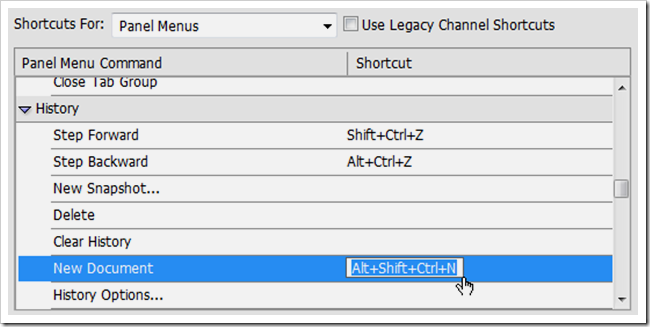 If you’re constantly using a tool from the menu, you may want to set it to a key combination that has a natural hand motion, like Ctrl + F. Many of these “naturalistic” shortcuts (Ctrl + S, Ctrl + D, Ctrl + C, etc) are already taken—some by useful shortcuts, and some that may not be useful to you at all. If you never use the conflicting shortcut, “Accept and Go To Conflict” will allow you to fix the conflicting keyboard shortcut or possibly delete the conflict. You can also edit the shortcuts for the toolbox. This can come in handy since some tools don’t have keyboard shortcuts out of the box. If you’re using them constantly and want to have a keyboard shortcut, here’s where you add it. In addition to even this deep level of customization you can also create keyboard shortcuts for items in Panel Menus that might not have regular menu items. 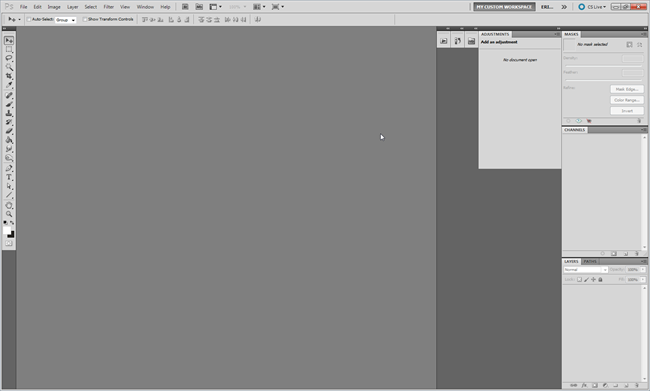 This means that pretty much anything in Photoshop that you can click on, you can create keyboard shortcuts for. While we recommend you learning the basic set of keyboard shortcuts as is, it’s to your benefit to set your own and become a real Photoshop keyboard ninja. 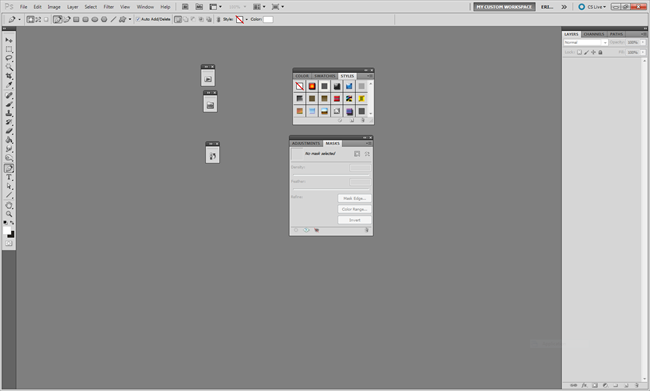 Navigate to Edit > Menus to bring up the dialog box that customizes the Photoshop menus. 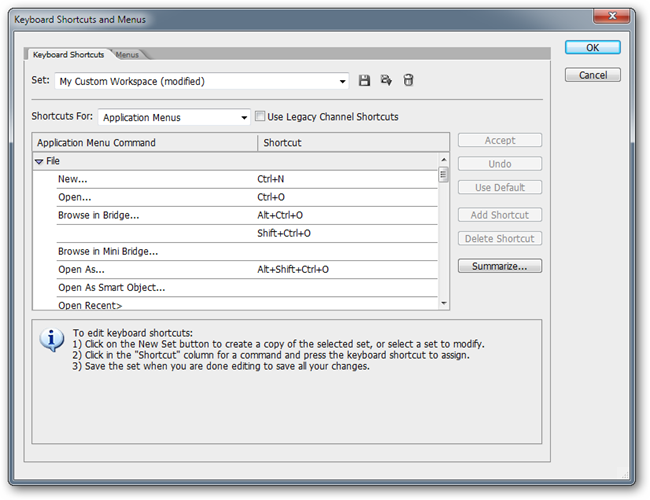 Note that there’s also a tab to jump from Keyboard Shortcuts to Menus in the dialog box. Here you can hide menu items you don’t use to save you time by shortening the long list you have to mouse over. You can also highlight your menu items in colors to save yourself some the trouble of looking through a long menu of plain black on gray text. If you’re not into highlighting your most important menu items, you can highlight every other one for increased contrast between lines. Or just for decoration, if that’s your thing. That about wraps it up for those Photoshop customizations. But what do you do to customize your Photoshop workflow? We’d love to hear your suggestions for shortcuts, tricks, and customizations that make your life easier. Make some noise in the comments and let us know what makes your installation of Photoshop really work for you.